"Owners are really nice and helpful." Have a question for Heng Sambath Guesthouse? Whether you're a tourist or traveling on business, Heng Sambath Guesthouse is a great choice for accommodation when visiting Kampot. Only 143 km away, this 2-star hotel can be easily accessed from the airport. 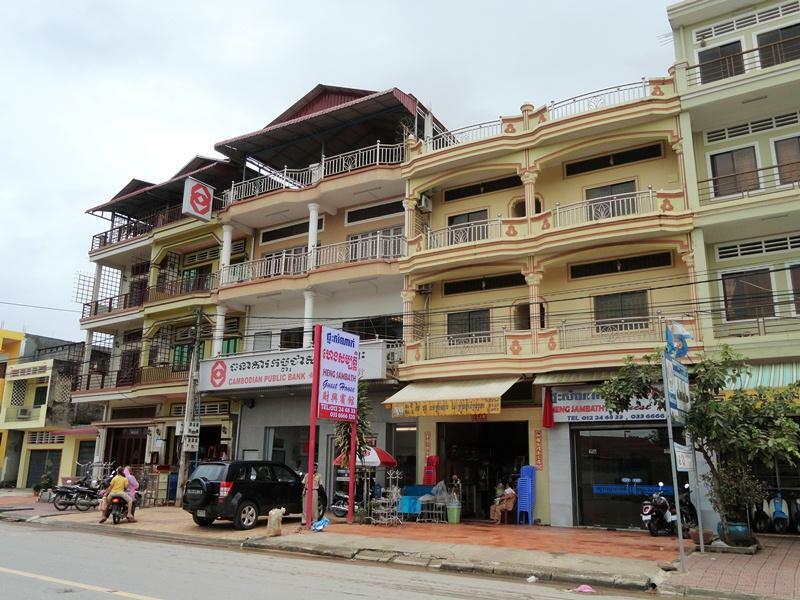 A haven of rest and relaxation, the hotel will offer total renewal just steps away from the city's numerous attractions such as Kampot Market, Durian Roundabout, Old Market Street. At Heng Sambath Guesthouse, every effort is made to make guests feel comfortable. To do so, the hotel provides the best in services and amenities. To name a few of the hotel's facilities, there are 24-hour room service, free Wi-Fi in all rooms, 24-hour front desk, facilities for disabled guests, luggage storage. Heng Sambath Guesthouse is home to 16 bedrooms. All are tastefully furnished and many even provide such comforts as internet access – wireless, internet access – wireless (complimentary), non smoking rooms, air conditioning, desk. Besides, the hotel's host of recreational offerings ensures you have plenty to do during your stay. Heng Sambath Guesthouse is an ideal place of stay for travelers seeking charm, comfort and convenience in Kampot. Upon arrival we were checked in to a twin room with a broken fan when we had booked a double room with a fan and hot water. The man at reception eventually “found” a spare double room but once inside we realised there was no hot water. We asked several times for the wifi password which the receptionist refused to give us stating the wifi wasn’t working even though the network was visible. We did eventually get the wifi password, the night before we checked out. If we had not have pre paid for 2 nights we would have left sooner. 6 usd, very big price, no hot water...it's all..
Water pressure. Clean towels. Has soap. Not fantastic. Next to noisy road. Late your group checked in at 11:30pm. Left items in the room accidentally. Came back next day, not to be found. Price, clean & comfortable room, convenient location. Hotel staff friendly upon arrival but during our stay the staff was often impolite for no apparent reason. My daughter got our room number wrong and the employee openly laughed and made fun of her to other employees. There are Tuk Tuks parked outside of hotel which is convenient. The drivers become rude and belligerent if you turn down their services regardless of how polite you are. One driver charged us twice the agreed upon price for his services once the ride was over. He definitely ripped us off. Overall it is a good value but staff and drivers outside hotel are unpleasant. You can make your stay more enjoyably by minimizing interaction with staff and Tuk Tuk drivers. Séjour agréable, hôtel à quelques centaines de mètres du bord de rivière avec les restaurants... Chambre propre, seul bémol réveil très matinal au chant du coq! Salle de bain rudimentaire et un peu exigüe avec possibilité de prendre une douche assis sur les toilettes, mais cela reste un très bon rapport qualité/prix! Possibilité de louer des scooters sur place pour aller visiter la région, 3gammes de prix : de 4 à 6$ en fonction de l'âge du scooter, nous sommes allés jusqu'à kep puis dans la campagne et le scooter était nickel aucun souci! Gia phong hop ly, phong sach, nhung hoi nho. снял номер за 6 долларов...в душе не было обогревателя воды (это норма для камбоджи). скутер предоставили мне без скидки..травку предлагали...вайфай как то глюкнул(( а ещё по ночам мяукает кошка, потом лает пёс, а в 7 утра начинается стройка... но есть и плюсы:рассположение рядом с дурианом... но вообще, за 5 долларов можно было бы найти и с горячей водой..